1. Apply standard grease to the black cam lever slot (where the black pin slides) frequently or about every 1000 tests. 2. Always keep your tester free from dirt and debris. Wipe all surfaces after each day if operating outside in dusty dirty environment. 3. Check the calibration of the tester peridically and be sure the cylinders compresses within the range engraved on it. If the tester repeatidly falls outside of calibration, you should consider sending in for repair. To pay by purchase order, select the items you wish to purchase, enter your shipping information then select “Submit Order” under “Pay By Check or PO Number”. After the order is submitted an option will appear to print an invoice that can be used as a quote to process the purchase order. The items will ship after the purchase order is received at G4battester@gmail.com. 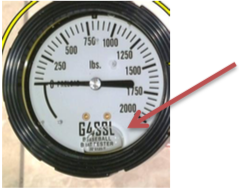 What if there is a bubble in my gauge or dial? Every gauge has a small air bubble. This is completely normal. It will not affect the performance of the test. The size of the bubble may vary based on environmental conditions (temperature, humidity, barometric pressure, etc). See photo below of a normal/average size air bubble. What if I get a passing and failing result for my two compression tests on one bat? You will compress the bat a third time at a different location and if a passing result is achieved, the bat passes. If a failing result is achieved, then the bat fails. Where should the certified bat sticker be placed? Place the sticker in the taper of the bat just above the handle or near the BBCOR word mark. The goal is to place it in a location where the umpire can see it. How do I distinguish between aluminum and composite barrel bats? The focus should be the material in the barrel of the bat, not the taper/handle. Note: a metal bat can have a composite taper or handle. This would still be a "metal" bat since you are testing the barrel of the bat. Typically the barrel material is listed on the bat. However, you can also check http://www.mme.wsu-ssl.org/certifiedbaseballbats.aspx. Once on the page, search for your bat model number and then look to the columns on the right to see it's barrel material. Where do I purchase a USSSA softball fixture? USSSA softball bat testers can only be purchased through the USSSA. They are out of stock for the foreseeable future. The USA Softball fixture uses the same pass/fail threshold as the USSSA fixture, where 1450psi (USA) = 220lbs (USSSA). The only difference between the fixtures is units. USA Softball reports barrel compression in psi while the USSSA fixture uses lbs. The USA Softball fixture is in stock and can be purchased online.